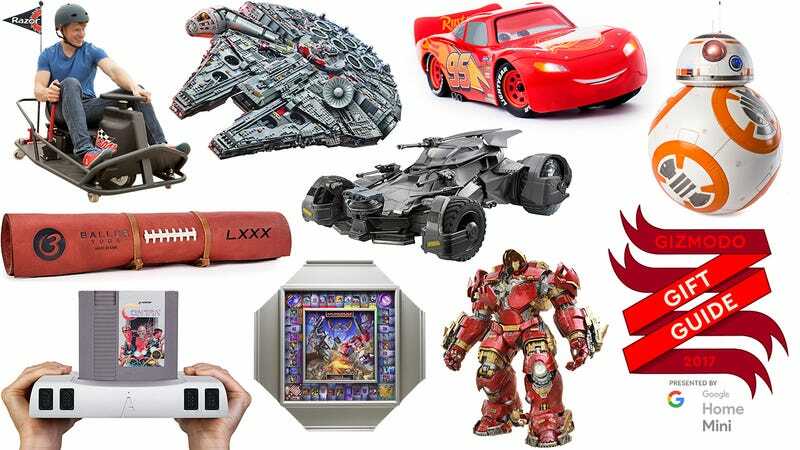 Every kid knows the best way to get almost every item on your Christmas list is to include one outlandish, obscenely-expensive item your parents will never go for. Out of guilt, they’ll happily deliver everything else on your list. But you’re an adult now, with a job and disposable income, so why not finally treat yourself to those top-tier items your parents would have scoffed at? Maybe you’ve been fiscally responsible all year, or maybe you’ve got a holiday bonus enroute. It doesn’t matter how you justify the frivolous spending, here are nine extravagant gifts the ten-year-old version of you would have never found under the tree, but the 30-year-old version might. Back in 2007, Lego released a 5,195-piece version of the Millennium Falcon that was the toymaker’s largest set to date. But with countless new Star Wars films enroute, Lego has finally upgraded that Millennium Falcon set with an additional 2,346 pieces, adding a tremendous amount of detail—and size—to Han Solo’s ride. The new version includes ten minifigures based on characters from The Force Awakens and The Last Jedi, the option to install the classic round or modern rectangular sensor dish, and, most importantly, tiny Lego Porgs! The classic, basic version of Monopoly will set you back just $20 at any toy store on the planet. But who wants to be basic? Winning Solutions, known for its opulent board game upgrades, has created a new version of Monopoly that will appeal to children of the ‘80s. Inspired by the original animated series, the game swaps luxury properties for Transformers characters, hotels and houses for energon cubes, and includes upgraded currency featuring Autobot and Decepticon logos. The board itself even transforms, closing up to store all of the game pieces inside—even the tiny Grimlock. Lots of kids found the original Nintendo Entertainment System under the tree on Christmas morning back in 1983. But fast-forward 34 years and you need a better way to enjoy your favorite 8-bit games on a modern, hi-def TV. Why settle for the limited selection of titles on Nintendo’s NES Classic Edition when you can dust off your original cartridges (Famicom too!) and play them in Analogue’s gorgeous, all-aluminum Nt mini. It’s engineered to perfectly play every last NES game on a big screen, and it even supports modern wireless controllers because tripping over cables was always the worst thing about classic gaming. Remote control cars are a longtime staple of Christmas mornings, but simply driving in circles around the living room got boring about 20 years ago. Sphero’s Ultimate Lightning McQueen can still do donuts around the tree, but the company used its robotics expertise to make this toy move and behave as close to the original Pixar character as possible. Independently-controlled shocks let Lightning lean into corners and wiggle his body, while a custom-shaped LCD display brings his windshield eyes to life. It’s controlled using a free app on your mobile device, and even includes a bunch of Lightning McQueen’s signature sayings, delivered through an animated mouth on the front bumper. Watching professional drifters like Ken Block slide their way around an obstacle course might tempt you to reach for the emergency brake on your own car. But minivans are terrible at drifting, and you’ve probably got a few kids in the back who easily get motion sickness. A better way to scratch your drifting itch is with Razor’s Crazy Cart XL which is specifically designed for adult-sized riders. Using a single wheel for both steering and acceleration, the Crazy Cart XL can slide around corners thanks to a set of casters underneath that are free to spin when you yank on a special lever. But with a top speed of 17 miles per hour, there’s little to no risk of injuring yourself, or your new toy. Calling Hot Toys’ sixth-scale, 21-inch tall Iron Man Hulkbuster replica just an ‘action figure’ would be an insult to the incredible amount of detail packed into this collectible. It’s got over 30 points of articulation, 16 different LED-powered light-up features (including an arc reactor), swappable battle-damaged armor plates, and a retractable helmet that reveals a smaller Iron Man Mark XLIII inside. It deserves to be sold as a work of art rather than just a toy, but even with an obscene price tag, few Iron Man fans will be able to resist actually playing with this one. Aside from new cars and babies, nothing smells quite as satisfying as fresh leather. So the next time you’re downward dogging, instead of breathing in the questionable fumes coming off a foam yoga mat, upgrade to one of Baller Yoga’s alternatives made from the same cowhide used in official NFL footballs. The mats even feature the same iconic white stitching as the pigskins tossed around during the Super Bowl, but you’ll never have to worry about making sure they’re properly inflated. What comic books don’t tell you is that tearing through the streets in an unlicensed muscle car equipped with machine guns and rocket launchers is just as illegal as whatever heist Batman’s latest foe is trying to pull. But you can legally get a taste of what it’s like to drive the Batmobile with this two-foot long RC replica based on Batsy’s ride in DC’s Justice League. It’s got rotating machine guns, a working exhaust that bellows smoke, and a camera in the cockpit that streams a live view of the action to the mobile app you used to drive it. Even Bruce Wayne would be jealous of this toy. Despite being set a long time ago, our own galaxy hasn’t quite caught up to the awesome technology seen in Star Wars—and that unfortunately includes droids. Having your own robotic companion is the dream of many introverted Star Wars fans, and Spin Master’s Hero Droid BB-8 is as close as they’ll get without spending months trying to build one. The little droid rolls, talks, has a light-up head, and it even responds to voice commands. It also comes with a wireless remote that can be used to manually maneuver BB-8, or you can slip it in your pocket and have BB-8 autonomously follow you around the house like a puppy that never needs to be housetrained.